For almost 43 years three school notebooks lay in obscurity in the County Armagh home of sixty two-year old James McRoberts. The closely filled pages recorded just over two years in his life in uniform as he played his part in what was then known as the Great War. 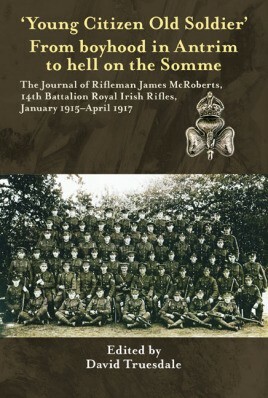 During the Home Rule crisis of 1914, one of several in Ireland's history, James McRoberts, like many other men, joined the Young Citizen Volunteers, an organization that eventually became the 14th Royal Irish Rifles, a battalion of the 36th (Ulster) Division. These notebooks, written at the time and with footnotes added some forty years later, record his Army service between 8 January 1915 and 3 April 1917. They tell, with remarkable immediacy, of his time at Randalstown, County Antrim and the move to Seaford in East Sussex. From here, after further training, James moved with his Battalion to the trenches of the Western Front. Written with a degree of humor and some detail his story covers the mundane routine of camp life, recreation behind the lines, the horrors of enemy shelling, the deaths of good friends and the momentous events of 1 July 1916 on the Somme, when his unit was in the thick of the action. On 1 November 1917, while acting as a scout for a night patrol at Messines Ridge, James was seriously wounded and evacuated to hospital - for him the War was over. Nevertheless, he continued to record what was happening around him both with humour and in detail. Classed as 80% disabled, he was eventually discharged and returned home to enjoy a postwar career as a surveyor in County Armagh. This is a remarkable memoir that is, by turns, lively, candid, humorous, poignant, and above all a window into the world of an Ulsterman who found himself both witness and participant to a series of remarkable events. His descriptions of army life, both daily routine and the inferno on the Somme in July 1916, add greatly to our knowledge of this most climactic period of history. David Truesdale opted for early retirement in 1998 and since then has written for films and television and produced two battlefield guides on behalf of the Royal Irish Fusiliers Museum - "The First Eagle: the 87th Foot at the Battle of Barrosa" and "Regulars by God! The 89th Foot at the Battle of Lundy's Lane". He is the author of "Brotherhood of the Cauldron: Irishmen in the 1st Airborne Division at Arnhem", "Angels and Heroes, the story of a machine gunner with the Royal Irish Fusiliers August 1914 to April 1915" (with Amanda Moreno), "Irish Winners of the Victoria Cross" (with Richard Doherty), "Leading The Way To Arnhem, a history of the 21st Independent Parachute Company" (with Peter Gijbels), "Arnhem Their Final Battle, the 11th Parachute Battalion 1943/44" (with Gerrit Pijpers). With David Orr he has written "The Rifles are There: 1st & 2nd Battalions The Royal Ulster Rifles in the Second World War" and "A New Battlefield; The Royal Ulster Rifles in Korea". They are currently in collaboration on a history of the Ulster Volunteer Force and 36th Ulster Division, 1913-1919. For relaxation he paints in watercolours following the Kelly school of innovation, photographs wildlife, listens to good music, drinks red wine and finds that Tomaso Albinoni (1671-1751) and his Oboe Concerto in D Minor, Op.9, No2, has been an inspiration during difficult times in any manuscript. David Truesdale took early retirement in 1998 and since then has written for films and television and produced battlefield guides for the Royal Irish Fusiliers Museum, The First Eagle: the 87th Foot at the Battle of Barrosa and Regulars by God! The 89th Foot at the Battle of Lundy’s Lane. He is the author of Brotherhood of the Cauldron: Irishmen in the 1st Airborne Division at Arnhem; Angels and Heroes, the story of a machine gunner with the Royal Irish Fusiliers 1914 to April 1915 (with Amanda Moreno); Irish Winners of the Victoria Cross (with Richard Doherty); Leading the Way to Arnhem: a History of the 21st Independent Parachute Company (with Peter Gijbles); Arnhem, Their Final Battle: the 11th Parachute Battalion (with Gerrit Pijpers obe); Victoria’s Harvest: The Irish Soldier in the Zulu War of 1879 (with John Young) and Young Citizen Old Soldier: the Journal of Rifleman James McRoberts. With David R Orr he has written The Rifles are There: 1st and 2nd Battalions Royal Ulster Rifles in the Second World War and A New Battlefield: The Royal Ulster Rifles in Korea. For relaxation he paints in watercolour, listens to good music, drinks red wine and finds that Tommaso Albinoni (1671-1750) and his ‘Oboe Concerto in D Minor’ has been an inspiration during difficult times in any manuscript. "McRoberts writes well, pays attention to detail and paints a picture which, although familiar to many of our members, will be worthy of attention as it is seldom done as well. We thank Helion for producing such a nicely-presented book."